I’m living the jet set lifestyle, well, sort of. At 8am the hubby dropped me off at the airport where I left my fabulous fur behind and slipped into a neon yellow, open cardigan from Express. Three hours later I’m in muy caliente Miami! By 3pm I’ve purchased new flipflips (this was a serious BudgetFashionista-style mission, documented on twitter) and had lunch just in time to meet with the wife-hubby team of Luara and Alex of LaLucca handbags. I was really excited when they gifted me a one-of-a-kind clutch! 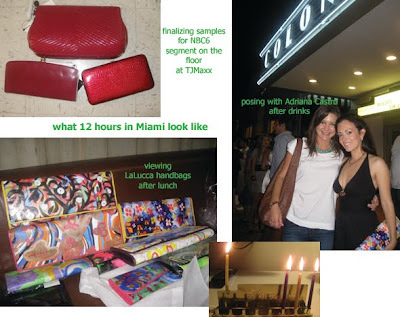 LaLucca is truly a marriage of art and fashion and very Miami. Each bag really has a soul and a story to tell. 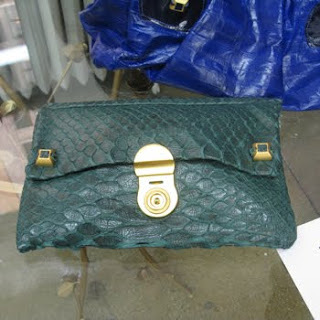 (More of LaLucca coming up on BagTrends.com probably in two weeks or so.) By 5pm I was at TJMaxx picking out a few more bags for tomorrow’s NBC6 segment on holiday clutches and snagging a two fashion pieces for myself – I can’t help it. By 9pm, after several hours of working from my hotel room and having dinner, it was off to have drinks with Adrian Castro and her husband, Luis, at Sushi Samba. Talking about exotic skin handbags, plans for a double date in New York, and new Adriana Castro ventures for 2010 isn’t a bad way to cap the evening. Oh, of course, I didn’t forget to light my traveling menorah! At left, see my day in pictures. It’s an early call time (8am) tomorrow for my NBC6 segment, which should air on December 16th in Miami. 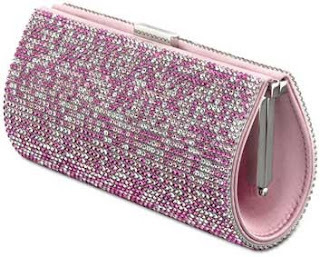 I hope you like all the affordable holiday clutch options up to 60% off department store prices. You'll recognize plenty of designer goodies. What a week! Michelle and I have been working hard to make sure the final BagTrends party of 2009 is fabulous. Great leather bags under $400 -check. Sleek Manhattan showroom location - check. Wine - check. Holiday music - check. Gifts with purchase - check. Wicked savings exclusively for BagTrends Bagistas - check. You having a great time with us - requires an RSVP! Join us next week, December 15th, and please don't forget to bring a used/new handbag to donate to Dress for Success. Dress for Success is an amazing charity organization that provides clothing to women who are about to go on a job interview. Let's make sure they have the full professional, bag-a-licious look! If you want to learn more about CETTU, here's a Behind The Bag video I shot at their NYC showroom with a brand representative. Yesterday was crazy. At 10:30am I shot a segment for BETTER TV (which airs next week). Then it was off to work from Cosi (my faux office in the city) on 2010 BagTrends calendar of events and other loose ends. 2:30pm I went to preview Radley London's Spring/Summer 2010 collection - super cute, review posting here on BagTrends.com in a week. I picked up the most adorable umbrella - best swag of the week!! Then is was back to Cosi for some more work and then downtown to preview Matt Bernson's latest shoes. The evening capped off with dinner with my pr friend Malorie of CameoPR and then we popped into the Atelier Minyon jewelry shop to drool over baubles. 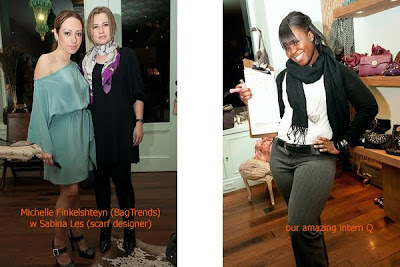 A special thank you to Nichelle of StyleMom.com for inviting me to the presentation. I'll post a few images later on this week. I can't, of course, let this verbal diarrhea post go without mentioning the bag I wore yesterday. My new CETTU tote, pictured below, got nine compliments throughout the day. It's really a stunning piece and for $400 a fabulous investment. 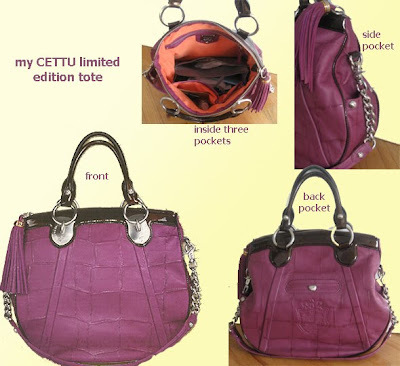 (You can get yours for 25% off December 15th at the BagTrends Party for CETTU Handbags). This tote does come in chocolate, but i just love purple. It is of course the color once reserved for the royals, and aren't we all the princesses in our lives? This is what my floor looks like the day before a TV shoot. Actually, this is after I've edited out lots of other bags - which will probably live in my work closet and only get returned in early January. HELP! I so need an intern. The segment I'm taping tomorrow is for BETTER TV about holiday handbags. The four groups are: "little luxuries" from Saks Fifth Avenue under $75, "affordable clutches" from TJMaxx under $150, "secondary lines" from Elle Nicole/Danielle Nicole and Carlos Falchi for Target/Carlos Falchi, and "smart splurges" from Kooba, Be&D and Katherine Kwei. The Kooba London tote (at right with python accent) is amazing. I've been itching for a good olive bag and it took all my professional strength not to wear this one! But, back to reality. The best part of this segment ... every one of these handbags will be given away via BagTrends.com. Details will be posted December 14 and the segment will air December 15. Check your local listings or watch it at Better.tv. We have a hot new handbag giveaway on BagTrends.com. The December Giveaway is Brahmin Handbags' Pin Tuck Tote in red ($395). Brahmin is a wonderful, family-owned brand, based in Boston, Massachusetts, with many of the bags made in the good-old USA. The bags, many of which are croc embossed, have a sophisticated appearance and reflect back to the name"Brahmin" which was used in the 1800s to identify high-society, Bostonian men and women. To learn more about Brahmin, I interviewed the brand's CMO, James Bunn, in our latest BagTrends TV series Behind The Bag. 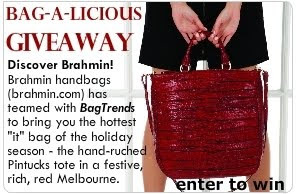 To WIN the Brahmin Pin Tuck Tote you must be a registered member of BagTrends.com. A winner will be selected on January 2, 2010. Even rain can't wash out a good party! 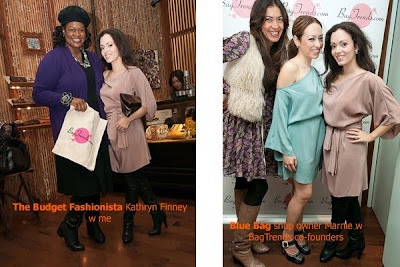 Thanks to everyone who came on Tuesday for BagTrends Holiday Soiree for Tucker Paisley. We had a blast. Michelle and I loved wearing Tucker Paisley's new Eliza dress. I ended up buying the metallic silver sample dress that Tracy, the designer of Tucker Paisley, let me originally borrow for the night. What can I say, this the season to shop for fabulousness. Three big thank yous belong to: our amazing intern Q (nobody poses better with a clip board than her), Marnie the owner of Blue Bag which hosted our event, and all the bagista babes that came out to have some fun with us. Couldn't make it to this shindig? Join us December 15 for our next party. This time we'll be ringing in holiday cheer and stocking up on last-minute holiday treats from CETTU Handbags. 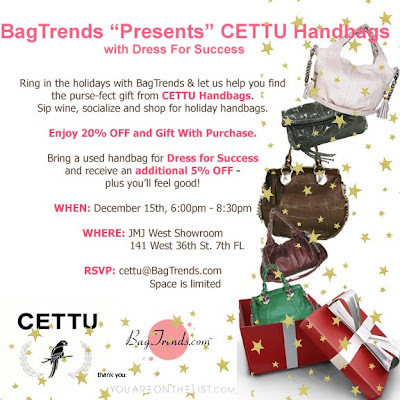 RSVP to cettu@BagTrends.com. 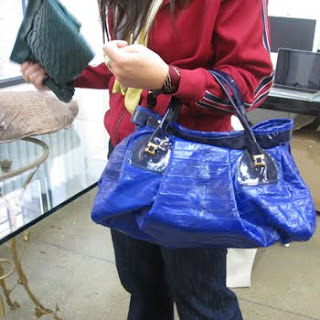 Visit BagTrends.com for more details. 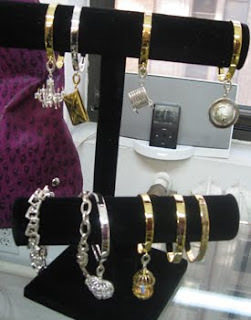 Last week I previewed Elliott Lucca, The Sak, Sakroots and Freebird summer 2010 collections - all part of The Sak Brand. I love this particular appointment for several reasons: the fabulous Andrea who handles PR, the affordable and stylish bags, the fact that smart questions are asked and notes are taken by the pr rep during the appointment, and getting to choose any handbag I fancy. That means, I get a bag from The Sak Brand about 5 times per year. Sweat perk no? This time, I'd like your help in selecting the handbag I should get. I've narrowed it down to a new silhouette from Elliott Lucca (see below). This satchel has signature woven detailing on the front, a generous opening, shoulder strap option, and plenty of pockets. I'm loving the white because I just need a new white bag and I like the tortes shell accent on the turnlock. The metallic navy color is also quite nice. So, which do you prefer for me? Leave a comment below stating which color you prefer and why ... who knows, maybe you'll win one too - hint, hint! Last month I went to Los Angeles for a week of fun in the sun -- OK, actually it was more like a week of driving around in a car while the suns rays burned through the windshield. 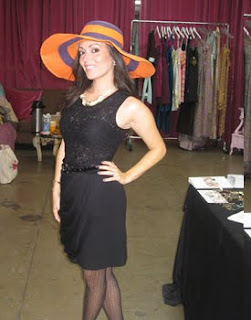 I was on a mission to find an amazing venue for an upcoming BagTrends LA Arm Candy Party (details to come). During my visit, I also checked out some of my favorite boutiques (including Arcade by Rochelle Gores) and finally had a chance to meet Tracy Fredkin founder of Tucker Paisley. For those that don't know, Tucker Paisley, is an accessories brand that originally started out making handbag with paisley prints on canvas and quickly expanded into using leather and suede. Tucker Paisley also makes small leather goods, scarfs (one of which I'm wearing in this video) and beachwear. Tracy and I hit if off so much that she's decided to come to New York and have BagTrends host a Holiday Shopping Soiree for Tucker Paisley. Michelle and I are really excited because we just love working with nice people and we both love clutches and Tracy makes lots of clutches. That's Tracy, at right, holding the Embossed Joey Clutch $155. I hope you can join us December 2 from 5pm - 8pm. Details Below. Space is super limited so you can only bring one guest. If your friends want to come, they must rsvp separately. RSVP: tuckerpaisley@bagtrends.com by Nov 30. Space is limited!!! I'm excited to announce that tomorrow you'll be able to enter the full world of Bulga as they launch their first company shop. The store will offer a range of merchandise from handbags and small leather goods to Bulga's line of denim. There will also be special bags, that will be sold exclusively at this VIP location. All gift purchases will be wrapped and shipped at Bulga’s expense and dropped off same day (if purchased in New York, of course). This is a soft opening and you're hearing it here first, so don't forget to mention my name or BagTrends when you pop in. Next week, I'll sit down with the designer Natalia Konovalovao dish on this new venture, her new baby and what lies ahead for Bulga. (We may even dish in our native tongue - so brush up on your Russian bagistas!) BagTrends TV segment to follow.